Used for protecting sensitive parts from heat and flame. Very good at reflecting light and thermal conductivity. 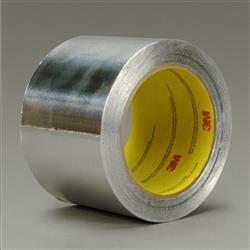 Jaco Aerospace and Industrial is your one stop resource for 3M(TM) Aluminum Foil Tape 4380, 2 mil aluminum foil, 1.45 mils acrylic adhesive, self-wound tape (Venture 807) and all of your 3M Products, Tapes, aerospace and industrial needs.